A clear sky. Low 37F. Winds N at 10 to 15 mph..
A clear sky. Low 37F. Winds N at 10 to 15 mph. Northern Iowa's Karter Schult, center chases downNorth Dakota State's Lance Dunn, left, in the first half of the football game in the UNI-Dome Saturday, Oct. 29, 2016, in Cedar Falls, Iowa. EAGAN, Minn. — Karter Schult made the most of his abbreviated season in the Alliance of American Football. The former Tripoli High School star and University of Northern Iowa All-American was signed by the Minnesota Vikings Tuesday less than two weeks after the AAF abruptly ceased operations. Schult played for the Salt Lake Stallions in the AAF and finished third in the league with seven sacks in eight games. He also ranked third in the league with 11 tackles for loss and led the AAF with 49 quarterback pressures. 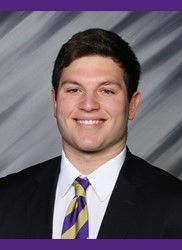 At UNI, Schult won the Buck Buchanan Award as the top defender in FCS and was named Missouri Valley Football Conference Defensive Player of the Year after leading FCS with 17 sacks as a senior. Schult joined the Cleveland Browns as an undrafted rookie in 2017 and recorded 11 tackles and 1.5 sacks in the preseason before he was released. He participated in a rookie minicamp with Carolina in May 2018 but was released by the Panthers.